Before he had left New Orleans, DeMarcus Cousins was traded there. And suddenly, the best Sunday story about two All-Stars reconnecting on Sunday had nothing to do with Kevin Durant and Russell Westbrook. The Sacramento Kings finally put an end to the Boogie Era and the New Orleans Pelicans put together a frontline of two All-Stars — one big, one bouncy — that are just 26 (Cousins) and 23 years old (Anthony Davis). The deal, which will send Buddy Hield and pieces (including the Pelicans’ 2017 first-round pick) to Sacramento for Cousins and Omri Casspi, has yet to be finalized. But when it is, it will shake things up quite a bit, and maybe elicit more trades between now and Thursday’s deadline. Contenders can always use one more guy. Second-tier playoff teams may feel like now is the time to join the contenders. Teams with young players may need to clear a logjam and all 30 teams are always planning for the future. It always takes at least two to tango, but now is the time when teams shed their inhibitions in order to strike a deal. Stay tuned, because there could be a lot more to come. This time last year: Deadline doesn’t alter the landscape — Channing Frye was the deadline acquisition who would eventually play the biggest role in the postseason. The Pistons got Tobias Harris from the Magic, but rescinded their deal for Donatas Motiejunas. The Nets hired Sean Marks, the Bucks moved Giannis Antetokounmpo to point guard, Damian Lillard dropped 51 on the Warriors and Anthony Davis went for 59 and 20 in Detroit. Plus-minus stud: Otto Porter (WAS) was a plus-58 in two games last week. Plus-minus dud: Myles Turner (IND) was a minus-51 in three games last week. Hero team of the week: Washington (2-0) — The Wizards didn’t lose any momentum going into the break, picking up wins – by a total of 35 points – over Oklahoma City and Indiana. Zero team of the week: L.A. Lakers (0-2) — The Lakers lost in the final seconds to the Kings and then drilled in Phoenix. East vs. West: The West is 184-152 (.548) against the East in interconference games after the East went 6-5 last week. Team to watch this week: New Orleans — The Pelicans have a new center and some big games this week, hosting the Rockets on Thursday before they have a road back-to-back in Dallas and Oklahoma City on Saturday and Sunday. The league has averaged 98.8 possessions (per team) per 48 minutes and 106.0 points scored per 100 possessions this season. NBA.com’s Power Rankings, released every Monday during the season, are just one man’s opinion. If you have an issue with the rankings, or have a question or comment for John Schuhmann, send him an e-mail or contact him via Twitter. The Warriors rank second defensively overall, but seventh (having allowed 107.3 points per 100 possessions in 15 games) against the league’s other top-10 offenses after getting smoked by the Nuggets on Monday. They open their post-break schedule with another top-10 offense, though it will be their third time playing the Clippers without Chris Paul. With both of their remaining games against the Spurs in San Antonio, the overall No. 1 seed isn’t quite locked up. The league’s two best 3-point shooters in February? Kyle Korver (30-for-47) and … LeBron James (20-for-33), who are a combined 63 percent from beyond the arc this month. The Cavs could continue rolling offensively after the break, but they might have to flip the switch defensively when the playoffs begin, because they’ve been consistently mediocre on that end of the floor all season and will be without Kevin Love through March. Believe it or not, they’ve been at their best defensively (allowing 103.7 points per 100 possessions) with Love on the floor. It’s remains incredibly difficult to pick against them in the East, but they’re likely to face better offenses on the way to The Finals than they did last year. The Spurs could get Pau Gasol (who has missed the last 15 games) back for their weekend stay in L.A., but should they break up their new starting frontline of LaMarcus Aldridge and Dewayne Dedmon? They’ve allowed just 95.2 points per 100 possessions in 323 minutes with Aldridge and Dedmon on the floor together (as opposed to 105.9 with Aldridge and Gasol on the floor together) and held their opponents under a point per possession as they went 4-2 on the pre-break portion of the rodeo road trip. Friday’s game against the Clippers is one of just three against top-10 offenses in the next five weeks. The Rockets are five games into a stretch of seven straight against teams currently under .500 and went into the break with just their fifth loss against that group (only the Warriors have fewer). They have the league’s fifth best starting lineup and the league’s fourth best bench, but is their a way to get better at the deadline? Trying to improve the defense could hurt the offense, which has moved up to No. 2 in the league with the Raptors’ decline and begins the post-break schedule against a top-10 defense. The Wizards’ only losses in their last 17 games were a result of Marcus Morris’ buzzer-beating tip-in and LeBron James’ miracle 3-pointer. They went into the break as the only Eastern Conference team in the top 10 in both offensive and defensive efficiency and are only a game in the loss column behind the Celtics for the 2 seed. But they have the tougher post-break schedule, with 17 of their remaining 27 games — including the one against Boston — on the road (where John Wall has shot 12-for-70 from 3-point range). They’ve won five straight away from the Verizon Center, but sport a 10-14 road record. We approach another trade deadline with Danny Ainge still holding onto the next two Brooklyn picks. But not since Ainge got those picks has his team been in a better position to contend for a championship. The Celtics have the No. 2 seed, the East’s easiest remaining schedule, and the ability to scare the champs if they can get another All-Star to join Isaiah Thomas and Al Horford. Whether or not they make a trade, they should be adding Avery Bradley (who has missed 20 of the last 21 games) and Jaylen Brown (who missed the last three before the break) for Friday’s game in Toronto. Despite the absence of Chris Paul, the Clippers have, along with the Wizards, the league’s longest winning streak (four games) coming out of the break. In beating the Jazz and Hawks last week, they not only got back into fourth place in the West. They also played their best defense since Paul’s injury (allowing only 80 points per 100 possessions) and jumped from 16th back to ninth in defensive efficiency. But they’ll begin their post-break schedule with a Thursday-Friday back-to-back against the league’s two best teams. After losing three straight games, the Jazz went into the break with an important win over Portland. They can grab a top-four seed in the West if they get Rodney Hood back (though their starting lineup with Joe Ingles has been the league’s best defensive unit that has played at least 100 minutes) and if they continue to be the league’s third best road team (outscoring opponents by 3.2 points per 100 possessions). Fifteen of their 25 remaining games are on the road and nine of those 15 are against teams that currently have winning records. The Grizzlies went from bad offense and great defense in November and December to good offense and below-average defense in January. They’re back to being a top-five defense this month and have gone through the toughest part of their schedule. But it would be nice to get something out of Chandler Parsons (who has shot a brutal 25 percent from outside the restricted area) after the break. His ability to get his legs under him and turn his season around could be the difference between a team that gets through the first round and one that doesn’t. Russell Westbrook and Kevin Durant passed to each other and we have another month before they’re in the same building again. As Westbrook aims to be the first player in 55 years to average a triple-double, the Thunder will aim to move up from seventh in the West. And they have an easier schedule than the sixth-place Grizzlies, with only eight remaining games (fewest in the league) against teams currently over .500. They’e 21-9 against teams currently under .500, but went into the break with some defensive slippage. No team needed the break more than the Raptors, who went 5-11 (and ranked 24th offensively) over the last month. With some rest, with Patrick Patterson hopefully recovered from his knee injury, and with the addition of Serge Ibaka, they’ll try to hit the reset button with important home games against the Celtics and Wizards in the next 10 days. Ibaka hasn’t really played big on either end of the floor this season, but could combine with Patterson to give the Raptors a more versatile frontline late in games. With Cory Joseph struggling and Patterson banged up, Jonas Valanciunas has been on the floor for 64 percent (82 of 129) of their clutch minutes, up from 57 percent last season. The record says they’re a similar team, but the point differential (that of a team that’s 27-29) says they’re much worse. Only Oklahoma City and Orlando have seen a bigger drop-off in NetRtg from last season. Still, with a chance to get back to the conference semis and with some extra Draft picks in their bag, the Hawks could be buyers at the deadline. The defense that ranked No. 1 over their 13-game winning streak allowed 115 points per 100 possessions over their last three games. But after disappointing losses to Philadelphia and Orlando, the Heat went into the break with an impressive, wire-to-wire win in Houston. It took them a long time to have a lineup that played at least 100 minutes and though they now have one, it hasn’t been that great — getting outscored by 6.1 points per 100 possessions — and since the start of the winning streak, they’ve been at their best with some reserves on the floor. They have the easiest remaining schedule of teams 6-11 in the East right now. The Pacers take a six-game losing streak into the break, allowing no fewer than 114 points per 100 possessions in the six games, in part because the schedule was tough. Five of the six games were against the Cavs, Wizards and Spurs and they’re now 7-12 against other teams with winning records. But there isn’t much relief on the other side of the All-Star break, because they have the East’s toughest remaining schedule, with 14 of their 25 games on the road and only three against teams that will be playing the second game of a back-to-back. Two home wins over two good teams — Toronto and Boston — without Dwyane Wade have the Bulls in position to get back to .500 on Friday. The first win came despite a bad performance from the bench and the second was thanks to a good performance from the bench. Together they made the Bulls 13-13 against teams currently over .500, with a losing record (15-16) against teams with losing records. They’re quite an enigma and could take a step forward (by acquiring a point guard or a shooter), take a big step backward (by trading Jimmy Butler), or just continue with their Jekyll-and-Hyde-ness by standing pat at the deadline. If there’s a second loser in the Cousins trade, it’s the Nuggets, who haven’t been able to put much distance between themselves and the teams — including New Orleans — chasing them for the No. 8 seed. But the Nuggets have three games left to play against the Boogie-less Kings (while the Pelicans play them just once). Forty-eight hours after handing the Warriors their worst loss since opening night, the Nuggets lost to Minnesota, scoring only 39 points in the second half against a bottom-10 defense. They play seven of their next nine games at home and six of the nine against teams with losing records. Though Reggie Jackson probably hasn’t been 100 percent all season and had one of his best games (22 points on 8-for-12 shooting) in Wednesday’s win over Dallas, Stan Van Gundy may be ready to move on from the starting point guard (who provided a boost when he was acquired two years ago) and hand over the reigns to Ish Smith, who has shot 61 percent over the last 10 games. The Pistons have allowed 110.7 points per 100 possessions in their last five road games, but rank third defensively in February, and play nine of their next 13 at home. The good news is that Jusuf Nurkic was a plus-18 in 21 minutes, scoring 13 points on 5-for-5 shooting, in his Blazers debut in Utah on Wednesday. The bad news is that the Blazers still lost by 23 and have dropped five of their last six games, allowing 113 points per 100 possessions. So we’ll see if Terry Stotts turns to Nurkic either as a starter or down the stretch of close games. They’re in that mix for the No. 8 seed in the West and have the league’s easiest remaining schedule. But things don’t get too comfortable until late March, because they play 10 of their next 14 games on the road. The Anthony-Davis-as-a-full-time-center experiment lasted less than two months. With the pending acquisition of DeMarcus Cousins, the Pelicans have an All-Star frontline, should climb out of the bottom five in offensive efficiency, and are looking like a playoff team. But the trade has left them with a hole on the perimeter and they have a tougher remaining schedule than the eighth-place Nuggets, who they trail by 2 1/2 games. The two teams will face each other three times in a 13-day stretch in late March and early April. When a team trades its best player, its own picks typically become more valuable than any that it acquired in the deal. But the Kings could concievably drop below the Sixers in the standings and then have to swap first round picks with Philly in June. On top of that, the Sixers own the Kings’ 2019 pick (which is looking like another Lottery pick unless things dramatically change) outright. Time will tell if Buddy Hield, already 23 years old, can make a big jump or if the departure of Cousins will create a better culture in Sacramento. The Sixers lost a potential trading partner with the DeMarcus Cousins trade to New Orleans, but still came out a winner in the deal, because they can swap first round picks with the Kings this year and own Sacramento’s pick (with no protections) in 2019. Whether or not Joel Embiid and Ben Simmons play together in the next two months, the continued development of two other rookies — Dario Saric and Timothe Luwawu-Cabarrot — is worth keeping an eye on. 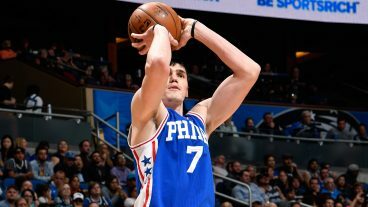 Saric has already shown a lot of improvement and TLC, with his length on the perimeter, could prove to be a great fit next to the other core pieces if he can knock down shots. Things would be a lot more interesting in the West if the Mavs didn’t go into the break with a bad defensive game against Boston and an ugly offensive game in Detroit. Even with those losses, theyve still been the most improved team since Jan. 1, 6.6 points per 100 possessions better on offense and 2.4 points per 100 possessions better on defense than they were through December. They got Andrew Bogut back on Wednesday, are just three games out of the No. 8 spot, and probably feel an obligation to give Dirk Nowitzki another run at relevance. But they should be sellers at the deadline, with four teams (one that just added an All-Star) between them and a playoff spot. After a 2-12 stretch in which they lost Jabari Parker and fell to 11th place, the Bucks won three straight games (scoring 122 points per 100 possessions) to get back to within a game of the eighth-place Pistons. Khris Middleton broke out with 20 points on 7-for-13 shooting, went over his minutes limit, and hit a key runner and the game-sealing free throws in Wednesday’s win in Brooklyn (his fourth game back). The Bucks have a more difficult schedule than Detroit or Chicago, but play eight of their first 10 post-break games at home. The Hornets went into the break with an absolutely brutal fourth quarter in Toronto, shooting 3-for-18, turning the ball over five times, and turning a 17-point lead into a five-point loss. Their only win in their last 12 games was by four points, at home, over Brooklyn. They’ve been the league’s worst fourth quarter team and rank 27th offensively over the 1-11 stretch, with everyone other than Nicolas Batum combining to shoot 30 percent from 3-point range. Though they’re eight games under .500, they still have a positive point differential (that of a team that’s 29-27) and a healthy Cody Zeller could make a big difference going forward. But they’re on the road for their first six games out of the break and they’re the only team without a road win in 2017. Having won three of their last five games, the Wolves are still in the playoff picture. But they have the league’s toughest post-break schedule by a pretty wide margin. Not only do they have the highest aggregate opponent winning percentage, but also the most road-heavy remaining schedule, with only nine of their 25 games at home. They’ve had the league’s fourth best offense (115.3 points scored per 100 possessions) since Zach LaVine was lost for the season, and three of those seven games were against top-10 offenses. 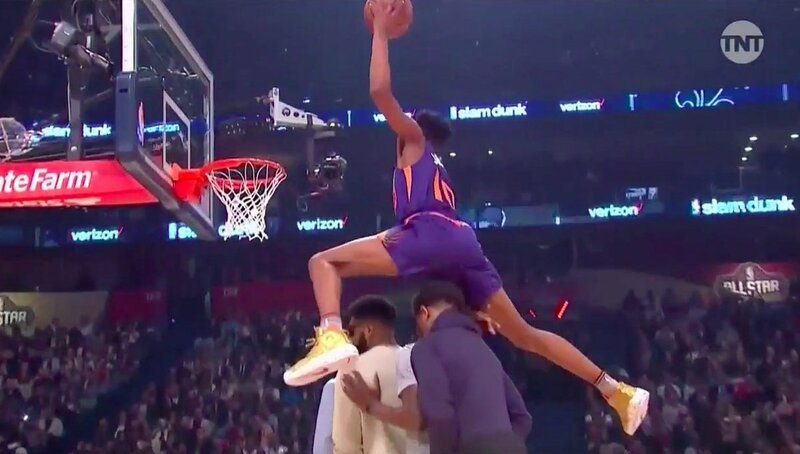 The Suns have the league’s second worst record and are going to miss the playoffs for the seventh straight season, but there are some signs of progress if you look close enough. They’ve been the league’s seventh most improved offensive team and haven’t regressed defensively vs. the league average. Since Jan. 1, they’ve scored 111.8 points per 100 possessions and are a plus-19 with Eric Bledsoe and Devin Booker on the floor together (after the pair registered a plus-31 in Wednesday’s win over the Lakers). It’s not like their defense could get much worse if they traded P.J. Tucker at the deadline. It’s kind of fun that the Knicks begin their post-break schedule in Cleveland, but Carmelo Anthony hasn’t given any indication that he wants to be anywhere other than the Knicks’ locker room that night, and he has more leverage than Phil Jackson in their tug-of-war. If Anthony does stay, the Knicks probably have a few weeks to make one more run at the flailing teams holding onto the last couple of playoff spots in the East. After they visit Cleveland, they play seven of their next nine games against teams with losing records, but they’re just 5-11 since Dec. 13 (after starting the season 12-2) against that group. One thing to look forward to in the last two months of the season is more time together for D’Angelo Russell and Brandon Ingram, who are just the Lakers’ 26th most-used combination. A Lou Williams trade would not only open up some playing time, but also allow someone else to step up in the scoring department. Of course, it would also be nice if the Lakers could avoid finishing in the bottom three in defensive efficiency for the fourth straight season. But they have the league’s toughest remaining schedule in regard to opponent offense. Eleven of their remaining 24 games are against top-10 offenses and only five are against bottom-10 offenses. Aaron Gordon’s performance in the Verizon Slam Dunk contest was a good summary of the Magic’s season. The Serge Ibaka trade didn’t erase last summer’s mistake, but will allow Gordon to play more at the four, where he’s played just 21 percent of his minutes thus far. Of course, the Magic have been pretty bad (minus-10.7 points per 100 possessions) in those minutes. Another trade could further verify the direction they’re going after this season as Frank Vogel tries to establish something to build on (preferably on defense) over their last 24 games. The Nets are on a 14-game losing streak and begin their post-break schedule with an eight-game trip where every opponent (except maybe the one that’s 47-9) has a lot more to play for than they do. While it will be tough swapping a 64 percent chance at a top-three pick for No. 26, that’s a sunk cost and they’ll surely sacrifice their ability to win a few more games if a trade better positions them to for 3-5 years down the road. Still, the return of Jeremy Lin, who has played in just 12 of their 56 games, would be a huge boost to their offense with four of their eight games on the trip against top-five defenses.